FULLERTON, CA. 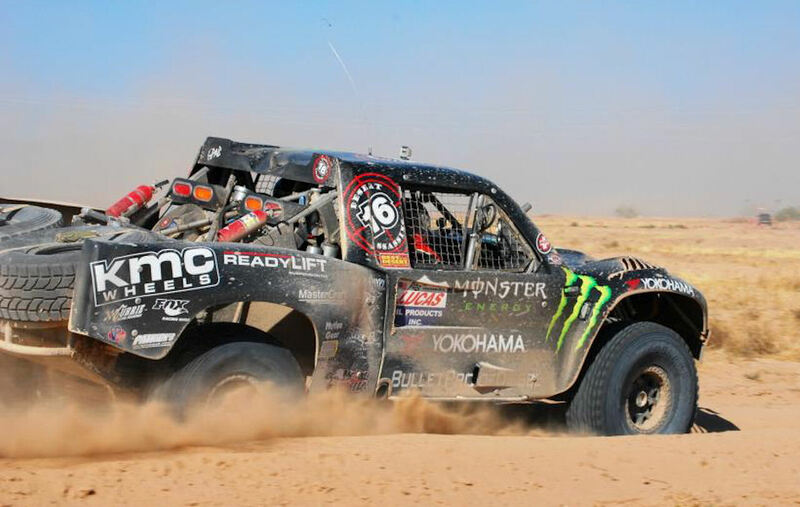 – (Nov. 14, 2011) – There’s plenty at stake for Yokohama Tire Corporation-sponsored off-road racing husband and wife team Cameron and Heidi Steele as they head to Ensenada, Mexico for the 44th annual Tecate SCORE Baja 1000, November 17-20. Heidi, a three-time titlist, is looking to capture championship number four in the Class 6 SCORE (Southern California Off Road Enthusiasts) division. She’s in first place heading into the season-ending Baja race, having won twice this year in San Felipe. Also at stake is chance for her to earn a prestigious Toyota Milestone award, which goes to the pro car and truck drivers who finish every required mile in the five-race 2011 SCORE Desert Series. As always, San Clemente, California-based Heidi and her co-driver Rene Brugger will battle the rugged 692.82-mile course in a Ford Ranger riding on off-the-shelf Yokohama Geolandar M/T+® tires. Cameron, a Trophy Truck class veteran, TV commentator and two-time SCORE Person of the Year, is looking for his first SCORE win of the year. At San Felipe, he powered his trademark No. 16 Geiser Brothers Chevrolet truck to a season-best fifth-place finish in the ultra-competitive Trophy Truck division, and seventh overall among all 77 racers. The 800-horsepower machine is mounted with newly developed 40-inch Yokohama Geolandar A/T-S® R tires specially engineered for extreme off-road conditions. In addition to Cameron’s #16, the Desert Assassins team will campaign a second Yokohama-shod Geiser Brothers Trophy Truck and have enlisted the help of Rick Geiser, Josh Daniels and Pat Dean to share in the driving duties between the two trucks. Yokohama Tire Corporation is the North American manufacturing and marketing arm of Tokyo, Japan-based The Yokohama Rubber Co., Ltd., a global manufacturing and sales company of premium tires since 1917. Servicing a network of more than 4,500 points of sale in the U.S., Yokohama Tire Corporation is a leader in technology and innovation. The company’s complete product line includes the dB Super E-spec™ – the world’s first tire to use orange oil to reduce petroleum – as well as tires for high-performance, light truck, passenger car, commercial truck and bus, and off-the-road mining and construction applications. For more information on Yokohama’s extensive product line, visit www.yokohamatire.com. Yokohama is a strong supporter of the tire care and safety guidelines established by the Rubber Manufacturers Association and the National Highway Transportation and Safety Administration. Details can be found at the “Tire Safety” section at www.yokohamatire.com.